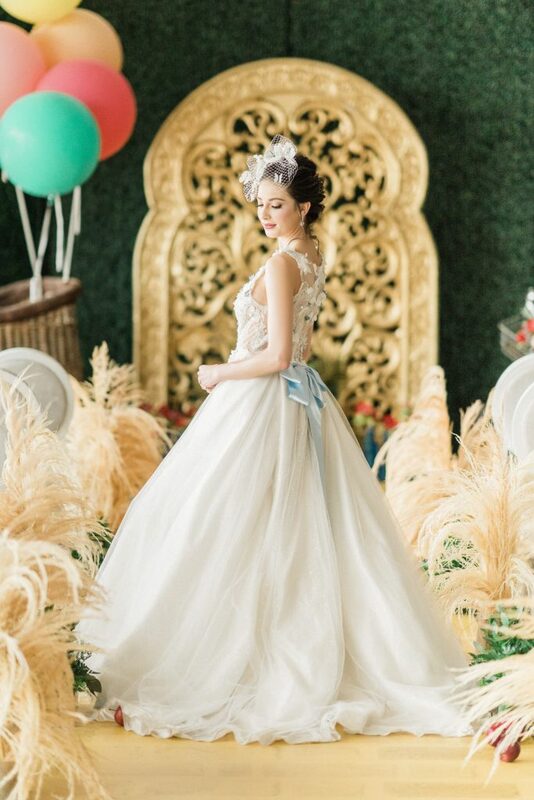 Wizard of Oz Themed Wedding Shoot as seen on WedLuxe | Luxury Toronto Wedding Planner | Devoted to You Inc. This year we organized a Wizard of Oz themed wedding, complete with our very own Toto! Produced by Carmen with the help of an incredible team, we designed and shot the styled shoot in the Spring, right before the busy wedding season hit. It can be a struggle to keep up with all of our events, preparing for early summer weddings and planning for others, but it’s all worth it when we see a beautiful event come together. Here are some photos we’re excited to share with you, all by the talented Anita at Rhythm Photography and hosted at Arlington Estates, one of the newest GTA venues in the stunning Kleinburg, ON. We also worked with Derek Chan at Derek Chan Films on the videography, and you can check out our work here in his video. 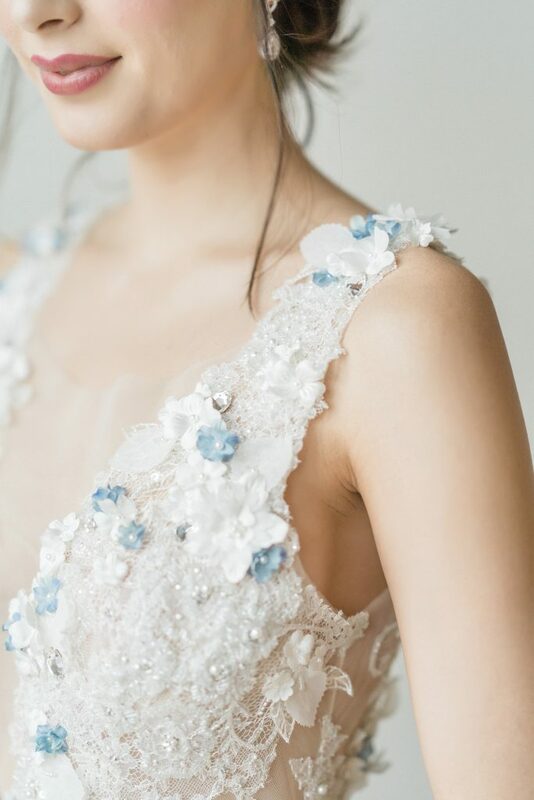 First, the dress from Valencienne Bridal, customized by the incredible Kim. She added in our “something blue” for good measure! The lovely hair and make-up was done by Satine at Satine Studio. Accessories were provided by The Loved One. The floral throughout this shoot, created by Zoe at Secrets Floral, was beautifully bold. While the reds stood out and brought that pop of colour every Wizard of Oz shoot needs, the delicate pink provided a textured offset. A Wizard of Oz themed wedding would not be complete without a yellow brick road, so we had our ceremony aisle transformed into one. How perfect is that Yellow Brick Road aisle runner, by Dance Floor Decor? The ceremony backdrop was breathtaking with captivating gold as the focus point, luscious greenery behind it and so many big and little Wizard of Oz themed elements, like the apples, floral design and a hot air balloon. The indoor green box wood and the golden gate were provided by Chairs & Thrones. And Dorothy’s vintage bike, provided by Southern Vintage Charm Rentals. And of course, the table details! 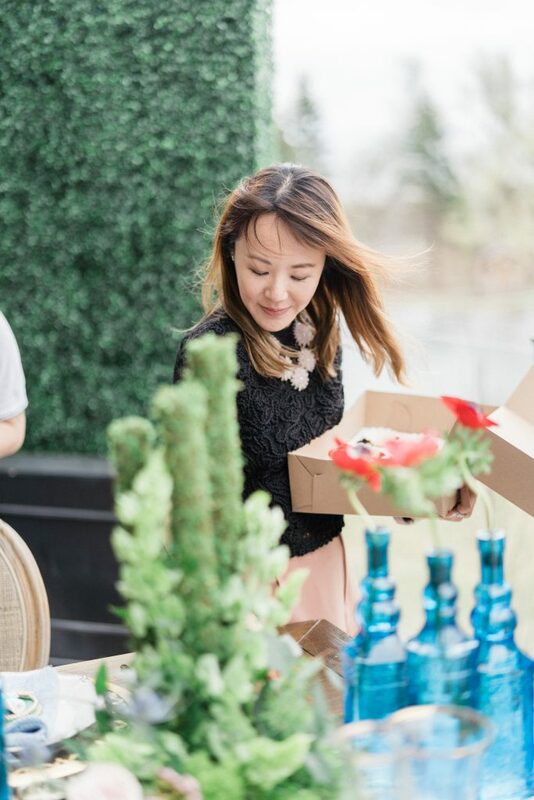 From the bright blue bottles to the garden themed decor, these tables were fit for a feast! The furniture was sent by Detailz Couture. Tableware and the hot air balloon are from Plate Occasions. The hot air balloon and basket makes an unforgettable talking piece. Balloons, provided by Sugar Girlee Co added more fun to this already adventurous shoot. The external boxwood, from Inspire Event Rental & Design, also helped to pull the theme together. Next, the cake and sweet table gave us all something to awe over. Sharon at Bloom Cake Co‘s work of art is below. Like any other wedding shoot, it’s all about the details. Check out the stationary provided by Ivory & Twine. Vintage bike provided by Southern Vintage Charm Rentals. Models: Devoted to You‘s Gloria Bairos, Joee Wong and Mojo the toy poodle!